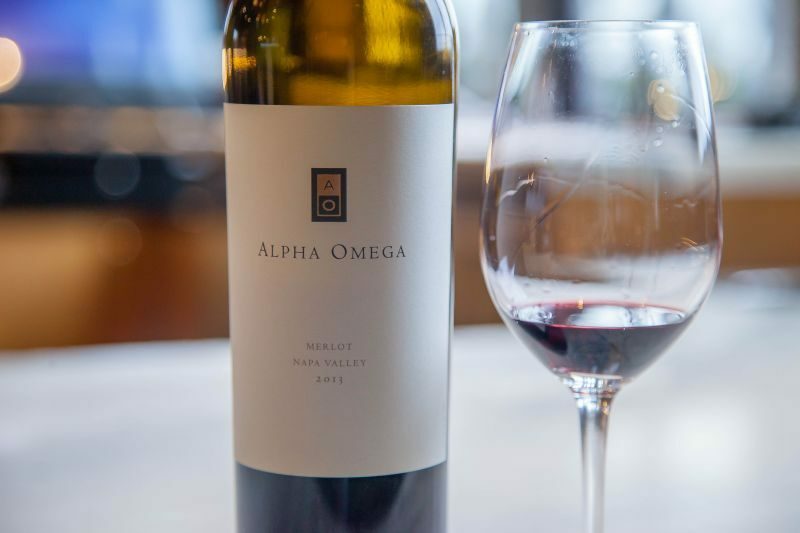 Alpha Omega is a boutique winery on Highway 29 between St Helena and Rutherford. 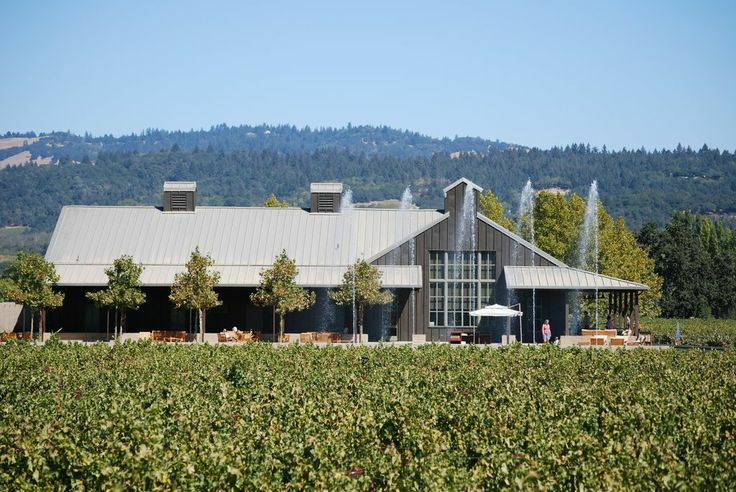 They have been making wine since 2006 and produce about twelve thousand cases annually. 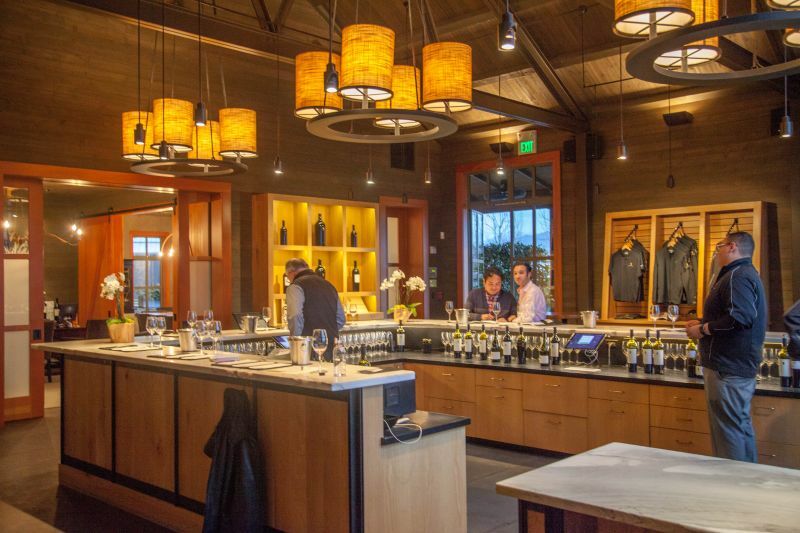 You will not find their wine in stores; 85% of their sales are direct to customers, with the rest being sold in restaurants. 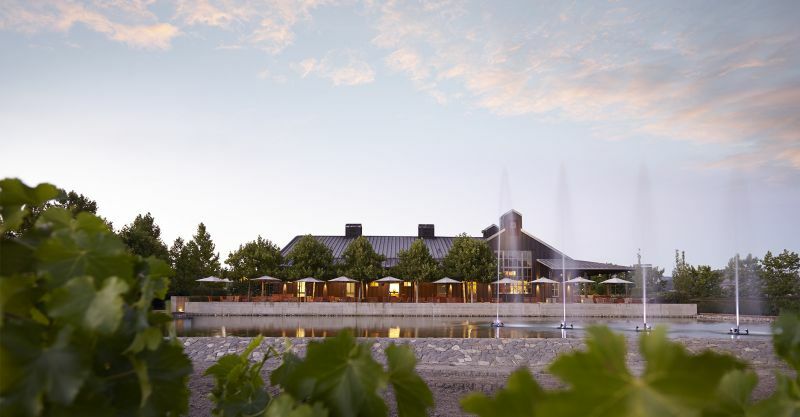 They source most of their fruit; their Sauvignon Blanc being their one estate wine. 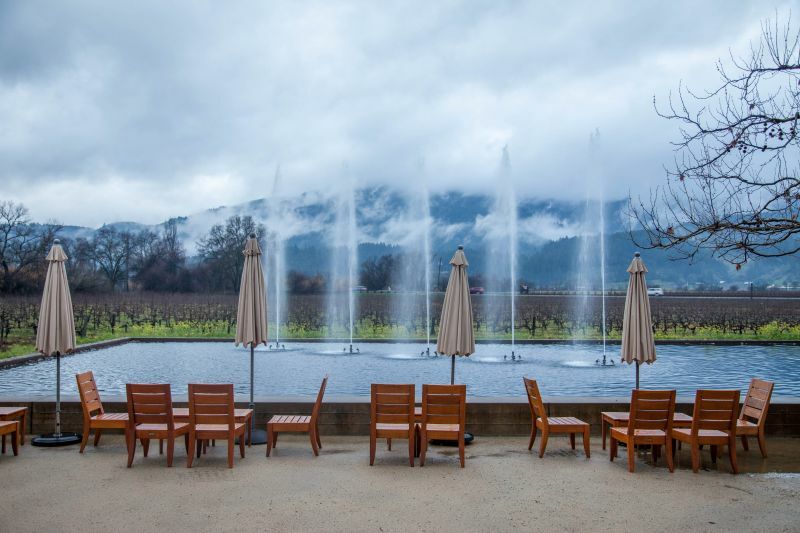 The Alpha Omega tasting room is a modern building that looks out over a large pool and fountains. There is seating outside, but we were there on a rainy day, so we tasted at the large U-shaped bar, where we received excellent attention. The winery was surprisingly busy given that it was a damp Thursday afternoon in February. California Girl comments: The aesthetics of the winery were lovely. 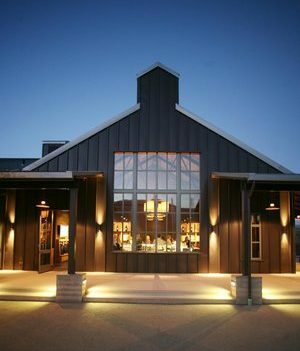 I would call the style of architecture on the exterior “Contemporary Barn”. The shape is barn-like but it is clad in metal work siding and roof. The interior is sleek and modern with a wide square tasting bar in the center of the space. Large windows look out to the vines and water feature. California Girl comments: I liked this sip; I thought it was well-balanced and easy to drink. It wasn’t overwhelmed with a ton of oak or butter. The fruit came through nicely and I really liked the vanilla and peach flavors in it. Next up was the 2013 Merlot ($94). This was fermented in stainless steel. The nose gave me blackcurrant and milk-chocolate. The immediate feel in the mouth was of soft silk that unraveled to present a long and complex taste of raspberry, blackberry, and tannins that enhanced the medium finish with black tea notes in a balanced melody with those lush fruits. California Girl comments: Unraveled Brit? Um ok, I liked this wine. It is an easy to pair with food kind of wine that I could imagine drinking with a dish such as stuffed bell peppers. It isn’t a fancy complex wine but would make the best out of any lighter beef dish showing its character. 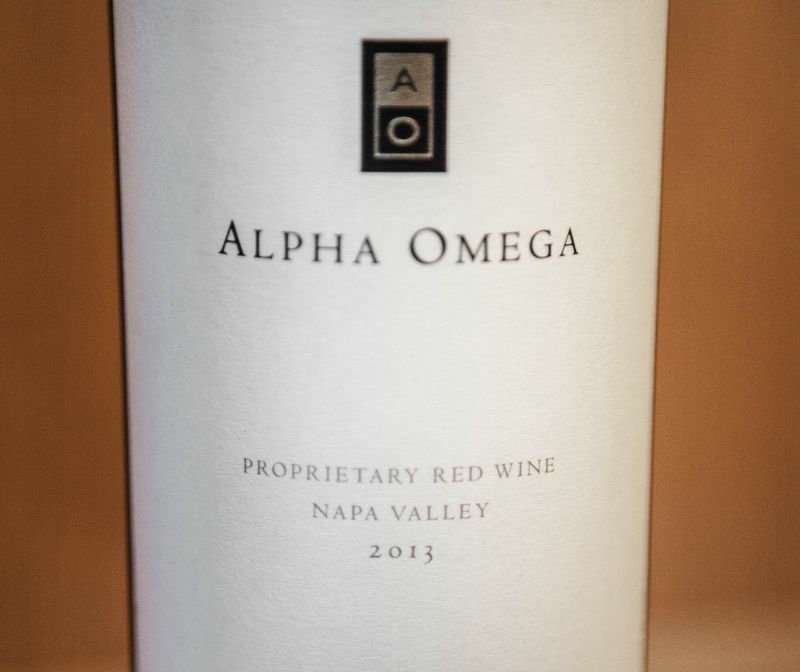 The third wine was the Alpha Omega 2013 Proprietary Red. This is fermented in new French oak and is a blend of Cabernet Sauvignon (61%), Merlot (32%), and Cab Franc (7%). It retails for $98. The nose has dark fruits with hints of coffee. The medium acidity is balanced by tannins that were restrained, despite the wine’s youth. California Girl comments: I really enjoyed the Proprietary Red. It is ready to drink right now or to hold back and age a bit. The next wine was a 2013 Cabernet Sauvignon ($98). The nose here had blackcurrant to the fore, with pepper and tea to add depth to the fruit aromas. The taste was richly fruited with blackcurrant as the most striking element. The tannins were already subtle and well integrated. This is a fine example of a modern Napa Cab that can be enjoyed young. My tasting notes for this finish with the words “Truly Wonderful”, an accurate reflection of my impression at the time, but reflecting on the later wines, I would now use less effusive language. California Girl comments: This was one of my favorites of the lineup. Again, this is a wine that was made for food. I think that is why this wine brand is popular, because it seemed to me to be very easy to pair with a wide range of food. The fifth wine that we tasted was the 2014 Era, a blend of Cabernet Sauvignon and other varieties commonly grown in Bordeaux. This wine sells for $225. The nose was raspberry, blackberry, and cinnamon. Taking a large sip I had black tea, black currant, and cocoa. There was a delightful sweetness, reminiscent of candied fruit, that lingered into the lengthy finish. Once more the balance of this Cab betrayed its youth. Here my comment on the tasting notes is simply “Wow”. California Girl comments: I really liked this wine, but it was hard for me to reconcile it to its price tag. Sure, I am up for spending money for a great bottle of wine, but this one didn’t give me that feeling of being so special I would splurge to drink it. That’s what this price tag is for most people. A splurge super special occasion wine. 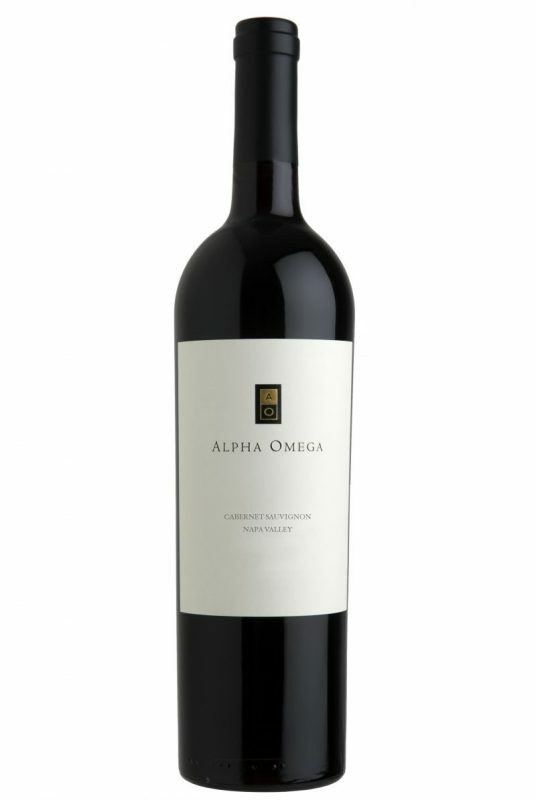 The sixth wine we tried at Alpha Omega was the 2014 Cabernet Sauvignon from the Stagecoach Vineyard ($210). The nose here was of raspberry and cocoa. The tannins were already fading and the wine had a complex blend of fruits with a distinct bias towards blackcurrant. California Girl comments: After I gave The Brit my tasting notes on this wine I reflected on it. I actually enjoyed the Proprietary Red more than this, and it is less than half the price. The final wine we tasted was From Beckstoffer To Kalon ($525 for three bottles). The nose was less fruity than the other Cabs; with the blackcurrant notes overwhelmed by damp forest floor sprinkled with pepper. The flavour was more in line with the previous wines; soft, dark fruits, and a light hint of cinnamon. 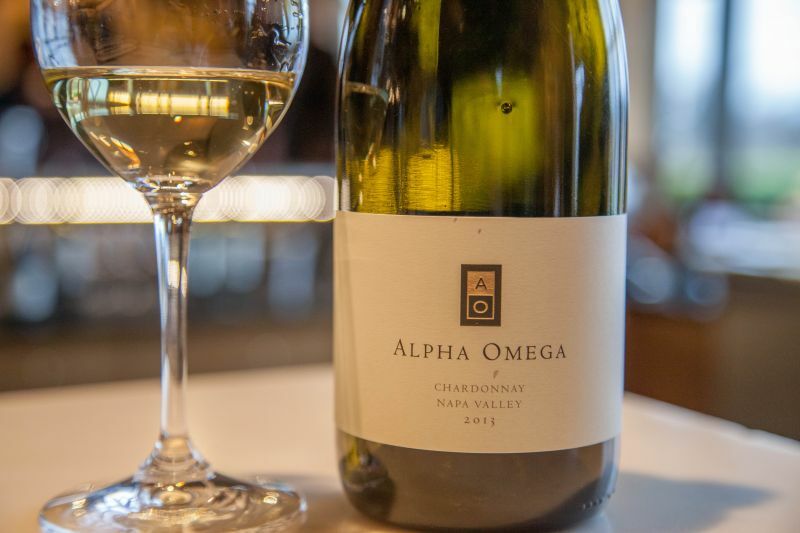 Alpha Omega offers a beautiful setting for tasting and some fine examples of wines that can be enjoyed now or in a decade. However, these complex and drinkable wines remind me of the Cabernet Sauvignon from Jean Edwards Cellars; whose prices are significantly lower.